In the Dutch weekly journal ESB (Economic and Statistical Reports), economists from the universities of Groningen and Rotterdam presented an interesting article. Their starting assumption is that high student evaluations will have a positive effect on the market share of universities. After all, if a programme in a particular university is highly ranked by students, more students will chose this particular university to attend that programme. On the basis of this finding (and the results of a simulation that they run), they present some interesting conclusions. I won’t go in details, but one of them is that there is no clear relation between evaluation and market share. Hence, students have other criteria than quality in the choice of where they will attend university (especially location, and in particular the distance to their place of residence). 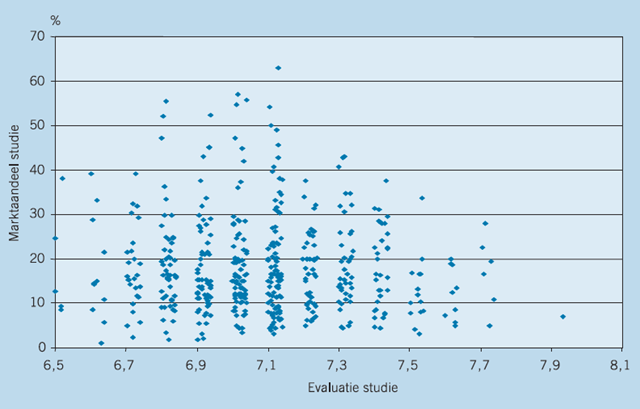 In their discussion, the authors indicate that this shows that competition on the basis of quality is not really taking place in the Netherlands. One reaction could be that the government should enable universities to compete on the basis of price. In other words, universities should be able to set their own tuition fees. This is currently not allowed for Dutch and EU students and the government decided last week that this will not be possible in the near future. Erjen van Nierop, Peter Verhoef, Philip Hans Franses. 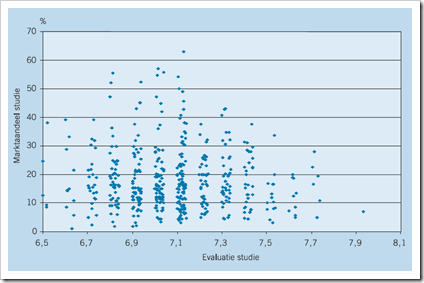 Studie Evaluaties en marktaandelen van universiteiten (subscription required). Economisch Statistische Berichten, 4 April 2008. Having studied economics I know it doesn’t provide the answers to everything but in this case I think you are right.